With the slow march of the stars to the west each evening and each season, the starry patterns form a celestial calendar. In the northern hemisphere, winter begins on December 21 at 4:44 a.m. CST. 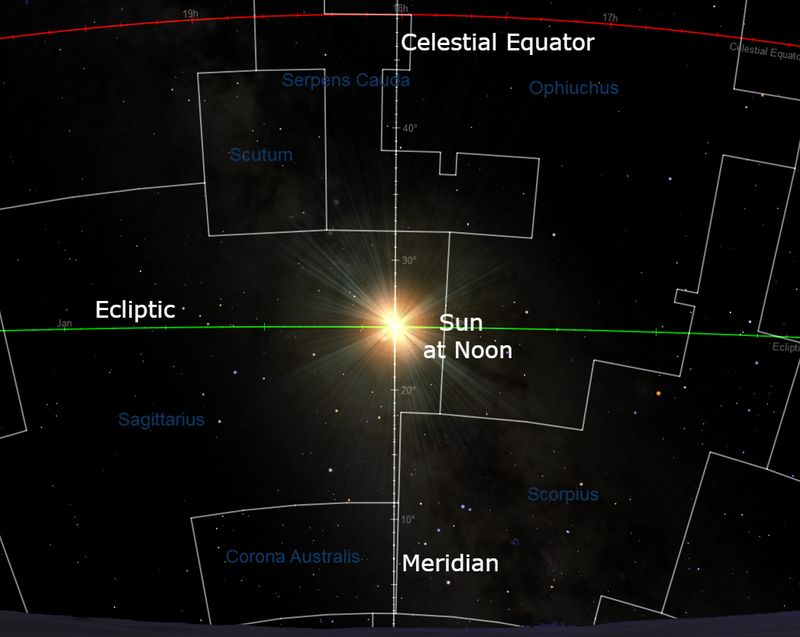 At this time the sun’s celestial coordinates are 18 hours of right ascension and -23.5 degrees declination. The sun passes overhead at Tropic of Capricorn, 23.5 degrees south of the equator. On ancient star maps, the sun appeared in front of the stars of Capricornus. Over time the earth has pivoted from the sun’s and moon’s gravitational forces so that the astronomical solstice point appears in front of Sagittarius. See more about this below. The group of stars that signal the beginning of winter is the informal group known as the Winter Triangle that are made of Sirius, Procyon and Sirius. This giant sidereal shape appears complete in the southeastern sky by 9:30 p.m. CST in late December. Sirius, the brightest star in the night sky, is distinctly blue-white through binoculars. It may twinkle vividly when viewed near the horizon on a clear, cold night from heat rising from your terrestrial surroundings. Procyon — known as “Before the Dog” because it rises a little before Sirius, the Dog Star — appears farther north along the eastern horizon. Procyon is not as blue as Sirius. The third corner of the triangle is Betelgeuse, the reddish star at the shoulder or armpit of Orion. Its colors are distinct through binoculars and a small telescope as well. The change of seasons brings us a procession of new celestial signs. 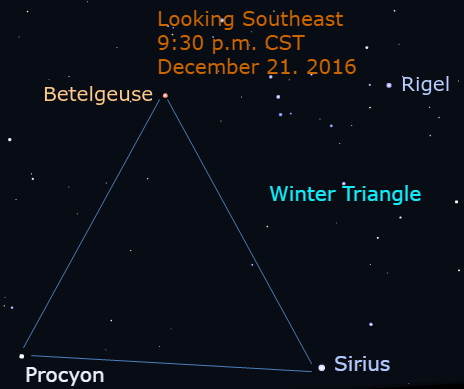 The Winter Triangle and other bright stars in the eastern sky tell us that Winter is here. Earlier this year the Internet’s heart fluttered when a NASA expert stated there were 13 “signs” (for example see) in the zodiac. This is not news. The zodiac is the constellations that form the background for the real and apparent movement of the sun, moon and planets. Notice on the chart above that the ecliptic, the plane of our solar system, goes through Ophiuchus, the Snake Handler, which may have been a predecessor to the modern physician. The time that the sun spends in front of the stars of Ophiuchus is longer than the time in Scorpius. This is the constellation that made the Internet’s heart skip a beat. And there are occasions when the moon moves through part of Orion. So there are 14 constellations that form the zodiac. It’s not news, though. Have a happy holiday season. For me, it’s Christmas, so I wish you “A Merry Christmas” and a “Joyous New Year.” For my readers south of the equator, it’s summer. Have a great time at the beach!